Any number can be Palindrome in Java, if it is remained same when we reversed it. For example 121 is a palindrome number because, this number remains same even after reversing it. In this article we show you, How to write a Palindrome Program in Java using While Loop, For Loop, Built-in Reverse function, Functions and Recursion. We will also show you the Palindrome Numbers between 1 to n.
If they exactly matched then it is Palindrome number otherwise, it is not the Java Palindrome number. Next line of this Java palindrome number program, we assigned the original Number value to the Temp variable. This will help us to preserve our original value and do all the manipulation on Temp variable. In the next line of java palindrome program, We used If Condition to check whether the Given Number is Equal to Reverse or not. We haven’t done anything special in this example. We just replaced the While loop with For Loop and if you find difficult to understand the For loop functionality then please refer Java For Loop article. Following statement in Java palindrome program convert the integer value to string value and also assign the converted value to Str variable. Next, we used the String Buffer reverse function to reverse the string. In this Java program we are using the same steps that we followed in our first java palindrome example. However, we separated the logic and placed in the separate method. Within this palindrome program in Java, If you observe the following statement, we are calling the PalindromeNumber(Number) method and assigning the return value to integer variable Reverse. NOTE: If we create a function with Void then there is no need to return any value but, if we declared a function with any data type (int, float etc) then we have to return something out from the function. This Java program helps us to enter any positive integer and then it will check whether the given number is palindrome number or not using Recursion concept. 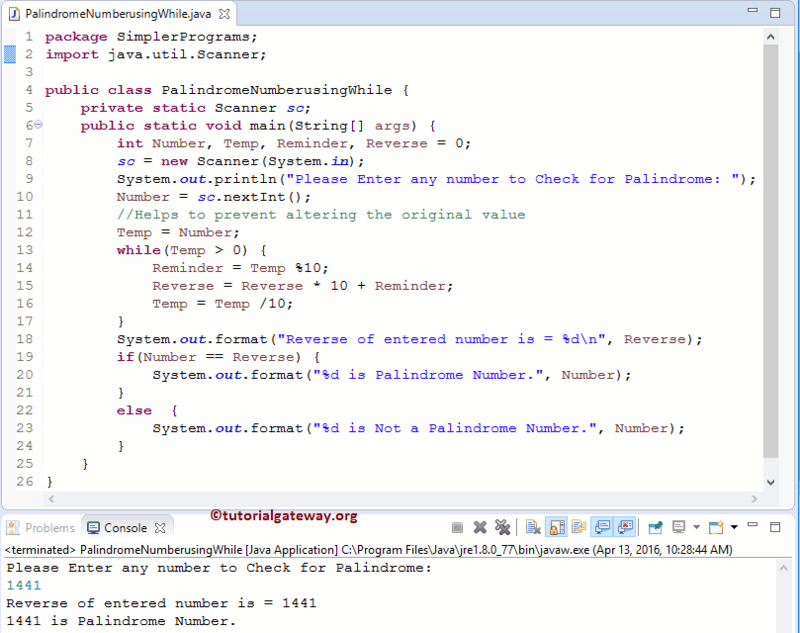 In this Java Palindrome program example, we are dividing the code using the Object Oriented Programming. To do this, First we will create a class which holds a method to reverse an integer recursively. First we declared an integer function reverseNumber with one argument. Within the Java palindrome function, we used the If statement to check whether the given number is greater than Zero or Not and if it is True then statements inside the If block will be executed. We already explained the Logic in above example. NOTE: reverseNumber (Number / 10) statement will help to call the function Recursively with updated value. If you miss this statement then, after completing the first line it will terminate. In the next line, We used If Condition to check whether the Given Number is Equal to Reverse or not. This Java program allow users to enter minimum and maximum values. 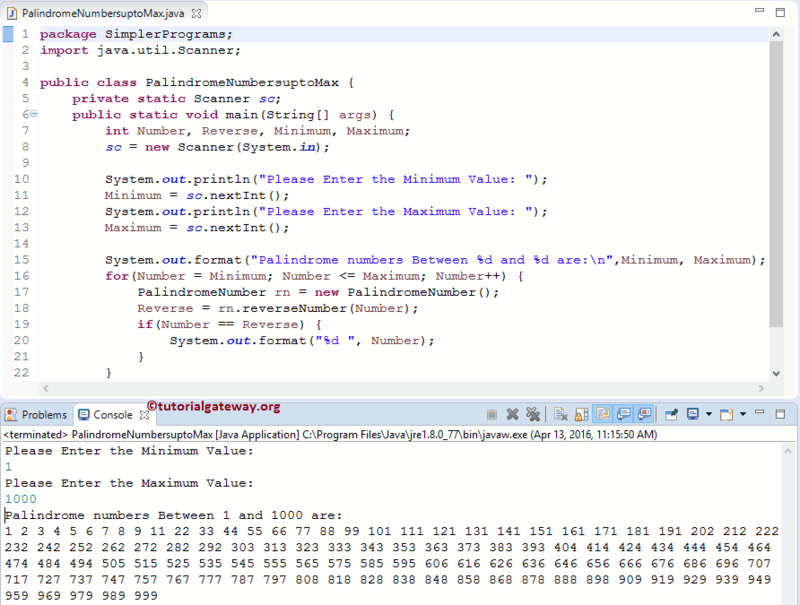 This Palindrome program in Java will find the Palindrome Number between the Minimum and Maximum values. This Java palindrome program allows to enter minimum and maximum values. Following For Loop helps compiler to iterate between Minimum and Maximum Variables, iteration starts at the Minimum and then it will not exceed Maximum variable. Below If condition will check whether the iteration number is exactly equal to Reverse number or not. If this condition is True, then it is Palindrome Number and below statement will be printed. Remember, you can replace the above code snippet with following code. Here, we are calling the reverseNumber function that we created in our recursive example.